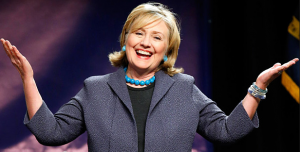 COULD IT REALLY BE POSSIBLE, IS HILLARY CLINTON GOING TO RUN YET AGAIN? In an OPED by Michael Goodwin of the New York Post, he speculates that Hillary Clinton, could yet be running again one more time in 2020. Personally, I doubt it but I would certainly be in favor of it. The more the merrier in the Democrat Presidential primary food fight. 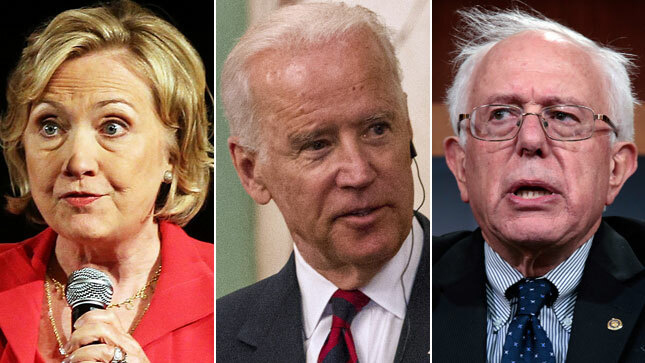 There really is no leader of the Democrat party, the so-called front runners Jone Biden and Bernie Sanders are dinosaurs. Who are Hillary’s competition, Sen. Kamala Harris in California, Sen. Cory Booker in New Jersey and Gov. Andrew Cuomo in New York? Really? It is yet another disastrous situation left from the Obama years, the Democrats have no bench. Hillary Clinton lost the race in 2016 no one thought she could ever lose. She has all but never accepted her loss to Trump and has blamed everyone but herself. Could she be that delusional to run one more time. Oprah appears to be out. Is it really possible that Democrats have no one else but Hillary Clinton to run again? According to a recent Harvard CAPS/Harris poll, with more than two years to go before the 2020 presidential election, former Vice President Joe Biden is the early favorite to represent the Democrats, Hilary Clinton is second and Bernie Sanders third. That is correct, the same old tired usual suspects are the leading candidates to take on President Trump in 2020. So the Democrats have the following as their best presidential candidates. Crazy Uncle Joe Biden, did we forget to mention CREEPY was first with 32%, Hillary Clinton, two time presidential candidate loser and the women who lost lost in the greatest political upset in history was second with 18%. And socialist Bernie Sanders was third with 16%. Doesn’t that just make you want to run out and vote? Did we mentions that for the 2020 elections, Biden will be 77, Hillary Clinton 72 and Sanders 78. What is this Jurassic Park 10? Honestly, I just can’t see Hillary running again after her 2016 debacle and her never getting over her loss. Sorry, but Biden and Sanders are too old. However, something tells me that Sanders will run and take the Democrat party of the liberal socialists cliff. Others making the poll and showing the further lack of a Democrat bench were Sen. Elizabeth Warren (D-MA) was fourth with 10%, who will be 71. 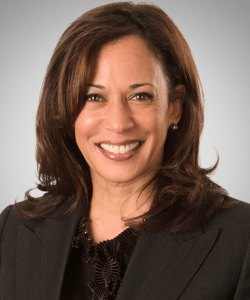 She was followed by Sen. Cory Booker (D-NJ) 6%, former New York City Mayor Michael Bloomberg 3%, Sen. Kamala Harris (D-CA) 2%, and Sen. Kirsten Gillibrand (D-NY) and New York Gov. Andrew Cuomo each with 1%. Wow, that’s it? Others who have been rumored to be running are Former Virginia governor Terry McAuliffe, Former U.S. attorney general Eric Holder, Former Massachusetts governor Deval Patrick. According to the LA Times, a controversial plan to split the Golden State into three new jurisdictions qualified Tuesday for the Nov. 6 ballot. The proposal aims to invoke Article IV, Section 3 of the U.S. Constitution. This is a radical suggestion, but not unprecedented. It would be the first division of an existing U.S. state since the creation of West Virginia in 1863. In the 2016 Presidential elections Hillary Clinton won the 55 electoral votes in California with a 61.8% to 32.8% victory. 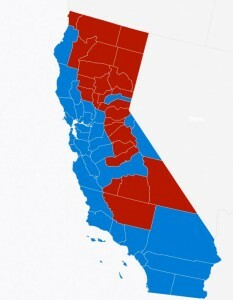 However, look at the blue/red voting by counties and compare to the proposed 3 state map above. 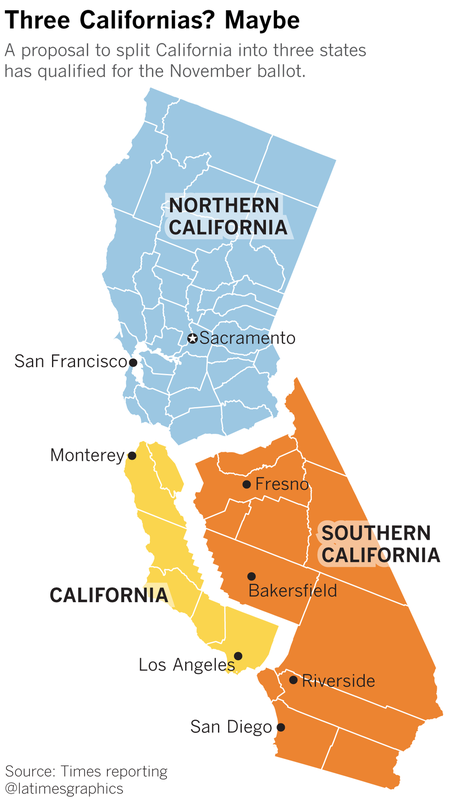 The representation voting and electoral college count would be quite different. WOW, THIS DUDE THINKS A LOT OF HIMSELF … ACTUALLY ERIC NOTORIETY IS NOT A GOOD THING. Republicans be fearful, former Obama attorney general Eric Holder is considering a run for the White House in 2020. According to Yahoo News, Holder believes that he has a certain status as the former attorney general and a certain familiarity as the first African-American attorney general. HUH? These liberals are legends in their own minds. 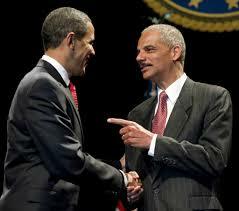 Most people probably have no clue who Holder is and could care less that he was the first black attorney general. It appears he is going to try and use his Obama coattails and be a part of the resistance to gain favor with the LEFT. These Lefties just cannot go away after they lose. Most individuals remember Holder for being a part of the gun running disaster known as Fast & Furious and the fact that he was held in contempt of Congress. Then as Legal Insurrection reminds us there was that little incident where he refused to prosecute the Black Panthers for voter intimidation. Eric Holder left office with a 26% approval rating. In his mind he thinks he is the next voice of the Democrat party. What a delusional world these Libs really do live in. All we have to say is RUN, ERIC, RUN!! !